The transition into winter is always better with snow. It was really beginning to pile up early in the week, and I made it out on a nice snow bike ride during Monday's storm. 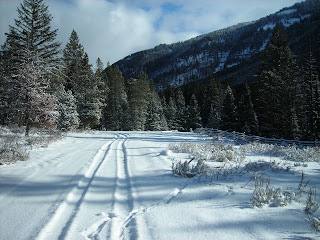 Here's a shot of Darby Canyon, taken shortly after my first winter wipe-out. Compared to summer mountain biking crashes, I learned (thankfully) that flying over the handlebars hurts a lot less with a blanket of snow on the ground. Just when I started thinking we were in for epic early snowfall, the temperatures warmed up and we had a mid-week meltdown in the valley. Driggs streets looked oddly like April for a couple of days, with slush and mud replacing snow and ice. Nonetheless, views have been stellar, as always. 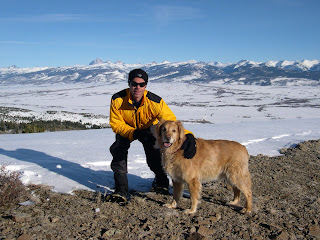 I dug into the archives for this classic photo on Henderson Ridge, with legendary Targhee dog. R.I.P. Back to point: fortunately it was all snow up in the hills this week, with more snow and cold forecast through the weekend. Grand Targhee is now reporting a base of 63", with 5" new today. 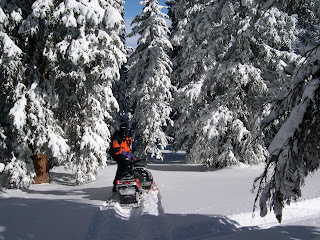 The riding up at Togwotee is good, and snowmobile trail grooming is set to begin in the Big Holes. 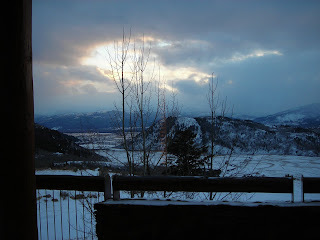 Teton Valley in general is settling into a nice winter mode. The "wintering" this time of year also means pre-holiday gatherings. Benefits, company parties, basketball games, friends getting together before traveling to see far-off family over the holidays. It's all a good excuse to reconnect with the community. 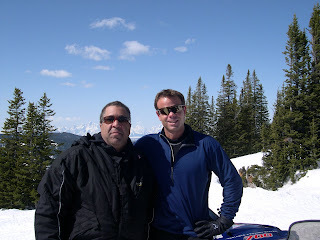 This is a favorite photo with my long-time brotha Jimmy, during an R.U. Outside group ride at Togwotee. It doesn't get much better, folks. Speaking of gatherings, this past weekend I ended up at a terrific shin-dig in Jackson. We spent a night at the unparalleled Amangani Resort. It was one of the nicest places I've ever stayed, but I was so in awe that all I managed was this photo from the balcony shortly after sunset. I'll take more pics next year.